His Highness Sheikh Mohammed bin Rashid Al Maktoum, Vice-President and Prime Minister of the UAE and Ruler of Dubai, has approved budget for the Emirate of Dubai for the year 2016. The UAE President His Highness Sheikh Khalifa bin Zayed Al Nahyan, Ruler of Abu Dhabi, has sent a congratulatory cable to His Highness Sheikh Mohammed bin Rashid Al Maktoum, Vice-President and Prime Minister of the UAE and Ruler of Dubai, on the occasion of his upcoming ten year accession day anniversary, wishing him greater benevolence towards his country and his people in the coming decade. President His Highness Sheikh Khalifa also thanked the Ruler of Dubai for the advanced administrative, governmental and developmental experiences he delivered during the past ten years. In a statement released on the occasion, which will be marked on January 4, His Highness Sheikh Khalifa said, "My brother His Highness Sheikh Mohammed bin Rashid Al Maktoum has completed ten years of ruling and leading a rational and sophisticated government, one of the most advanced and efficient governments in managing its services, with the testimony of prestigious international organisations. During ten years, he also established transparent systems of government administration in performance and quality standards, smart services, and establishing programmes to prepare future generations of human cadres. In ten years of governance, my brother Sheikh Mohammed bin Rashid managed to raise the standard of the government's competitiveness internationally by establishing institutions and work teams that focus on satisfying citizens and making them happy." He added, "We watched with appreciation over the 10 years, Sheikh Mohammed bin Rashid's government, which is characterised with its ability to establish coordination between federal government and local governments, form national teams and formulate strategic plans to achieve the vision of the leadership and continue developing the construction laid down by the founders alongside his fellow members of the Supreme Council Members and Rulers of the Emirates." President Khalifa continued, "My brother Sheikh Mohammed completes 10 years in leading a successful, balanced and sustainable national economy and an efficient financial government policy using his teams of ministers and officials. 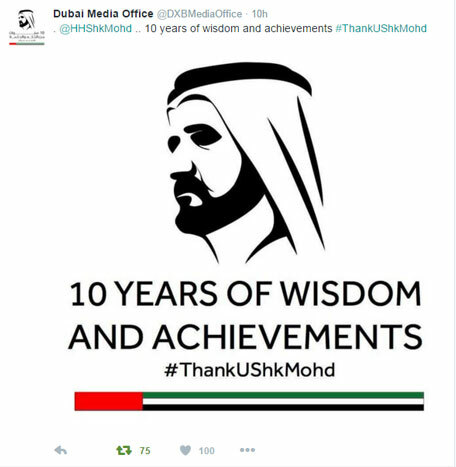 During these 10 years is also when my brother Sheikh Mohammed stood-out with his unique government philosophy in which the function of government officials is to bring happiness to citizens, and where government agencies are managed like the private sector, and rivals it with the services it provides. We observed him over 10 years inspiring thousands of young people and contributing with his brothers Their Highnesses Rulers of the Emirates in consolidating unity and cohesion among the people of the UAE and its leadership, and promoting a united, coherent and strong Emirati society, standing strong against the stormy changes experienced by our region." President Khalifa also highlighted that each year on his accession day, Sheikh Mohammed bin Rashid takes the opportunity to thank others, including mothers, the soldiers and the protectors of the nation, which ignites feelings of pride and enthusiasm in them. "Today, we say to him, thank you Mohammed bin Rashid for all that you have offered the UAE, Arab and Islamic nations, and for the entire world. Thank you for providing your administrative, humanitarian, economic, developmental and intellectual experiences," said the President. In conclusion, Sheikh Khalifa said, "I would like to thank Sheikh Mohammed on my behalf and that of behalf of my fellow Members of the Supreme Council, and my people. I congratulate him on the occasion of his 10 years of leadership, wishing for him a bigger, more beautiful and more giving decade to come."